Some people plan for the week ahead by meal prepping every Sunday, I plan for the week ahead by organizing just about every other aspect of the next seven days. I’m talking my workouts, when I’m washing my hair (correlating with said workout plan), my evening plans or work events, and more, and it all goes down on one little Post-It square. If you’re struggling to stick to a workout regimen or are looking for a structured way to bring a little more physical activity into your life, you don’t need any complicated apps or some long-winded workout plan, you need a pen, paper, and some good ol’ fashioned willpower. 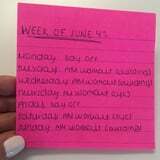 Every Sunday, I take a look at my calendar where I have my dinner dates and work events, and I try to figure out the most important thing: How the hell am I going to squeeze in five workouts this week? The answer is with a little bit of structure. As someone who does enjoy socializing after work, morning workouts are necessary – dreaded, but necessary. I like to break my week down into a.m. or p.m. workouts, and indicate if I’m signed up for a class, if I’ll be working out at my local studio, or if I’ll be working out at the gym in my apartment building. I smack the Post-It on my bulletin board in my kitchen, and there it stays until the next week. This may seem elementary, but writing this out every Sunday helps me stay on track with my goals and have structure each and every day. I’m well aware that I’m type-A and a sucker for to-do lists, but when you’re trying to maintain a social life, attempt a dating life, stay in physical shape, and network at work events, it’s important to stay organized. I know if I need to go to bed early to be awake at a certain time for a morning workout, I know when to pack my gym clothes for my after-work indoor cycling class, and it’s all thanks to one tiny little piece of paper. No one wants to be stuck canceling a workout because you forgot you made dinner plans, or even scrambling at the last minute to get on the wait list of a class you take every week. Think ahead, and you’ll be so happy you did. Of course, it’s absolutely OK if I miss a workout or oversleep, but it’s a colorful way to hold myself accountable – and what type-A human being doesn’t thoroughly enjoy checking things off a list? !